Sainsburys have reduced their Meal for Two boxsets to £5.00 from £6.99. In my opinion these taste better then either Asda or Tesco versions but are also better value as they weigh 1.7Kg whereas Asda is 1.4Kg and Tesco 1.5Kg. Offer runs till 3rd May....fill your boots. 1 Three colour pilau rice. Ace, an extra 200 grams of packaging! I've tried most of the supermarket curries.... I find sainsburys the best. Another vote for sainsbury's, the poor man's marks and spencers. Just included a pack of the tikka/madras in a home delivery. The ones at netto are about £3 and they are about the best I have had. I don't like these Sainsburys curries, the mild creamy ones are alright but everything else just tastes like slightly spicy Ragu. They are the nicest supermarket curries however if i am going to buy them I get them from the deli counter and freeze. If you have to buy more than 2 curries its actually worth going for 4 because you can then purchase the complete tub and it splits into 6 - 8 portions easily despite Sainsburys saying each tub is only 4 portions. Quick easy meal for the teenagers that never want to eat what your eating or at the same time as you. Shame it's for two and not for one!!! Is it just 2 curry and 2 rice in the box? Anyone know what sainsburys curries off the deli counter are like? Tried the Asda inestimable but they aren't the best. Is it just 2 curry and 2 rice in the box? 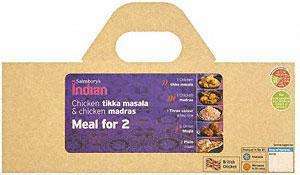 Anyone know what sainsburys … Is it just 2 curry and 2 rice in the box? Anyone know what sainsburys curries off the deli counter are like? Tried the Asda inestimable but they aren't the best. Very nice and although i dont eat a great deal of meat my hubby reckons the meat and chicken in them is good quality too. You can get the rice of the deli but realistically its cheaper to buy seperately and cook yourself. Fresh off asda deli is ok but the packed ones can be iffy from asda. No vegetarian option in there? Very unlike Sainsbury's - would have killed them to through a vegetable curry in there somewhere? Fair enough but it really is easy to make a quality curry from scratch - most are just one pot - fry some onion garlic and chilli, chuck in some spices and then some form of liquid like chopped tomatoes or coconut milk/cream - always taste better than the supermarket ones and if you buy the spices and garlic/chilli/ginger from an asian store you can get the whole lot much cheaper as well(in my experience as a student living in an asian area). No vegetarian option in there? Very unlike Sainsbury's - would have … No vegetarian option in there? Very unlike Sainsbury's - would have killed them to through a vegetable curry in there somewhere?